Defending society against natural hazards is a high-stakes game of chance against nature, involving tough decisions. How should a developing nation allocate its budget between building schools for towns without ones or making existing schools earthquake-resistant? Does it make more sense to build levees to protect against floods, or to prevent development in the areas at risk? Would more lives be saved by making hospitals earthquake-resistant, or using the funds for patient care? What should scientists tell the public when – as occurred in L’Aquila, Italy and Mammoth Lakes, California – there is a real but small risk of an upcoming earthquake or volcanic eruption? Recent hurricanes, earthquakes, and tsunamis show that society often handles such choices poorly. Sometimes nature surprises us, when an earthquake, hurricane, or flood is bigger or has greater effects than expected from detailed hazard assessments. In other cases, nature outsmarts us, doing great damage despite expensive mitigation measures or causing us to divert limited resources to mitigate hazards that are overestimated. Much of the problem comes from the fact that formulating effective natural hazard policy involves combining science, economics, and risk analysis to analyze a problem and explore the costs and benefits of different options, in situations where the future is very uncertain. Because mitigation policies are typically chosen without such analysis, the results are often disappointing. 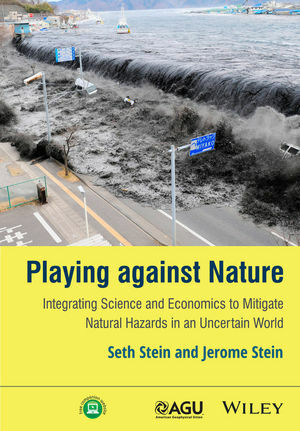 This book uses general principles and case studies to explore how we can do better by taking an integrated view of natural hazards issues, rather than treating the relevant geoscience, engineering, economics, and policy formulation separately. Thought-provoking questions at the end of each chapter invite readers to confront the complex issues involved. Seth Stein, Deering Professor of Geological Sciences at Northwestern University, is a seismologist interested in the science of large earthquakes and earthquake hazard mitigation. He has been awarded the James B. Macelwane Medal of the American Geophysical Union, the George Woollard Award of the Geological Society of America, the Stephan Mueller Medal of the European Geosciences Union, the Price Medal of the Royal Astronomical Society and a Humboldt Foundation Research Award. The late Jerome Stein, who was Eastman Professor of Economics at Brown University, had interests including decision theory and formation of public policy.